As the old saying goes, if it isn’t shouted at your hero by a strange man in the street, it’s not a dramatic plot twist. Legends is one of those shows that has no shame in following conventions. 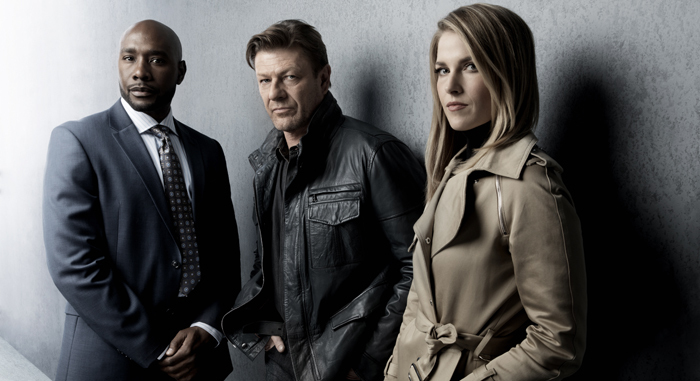 Sean Bean plays Martin Odum, a FBI agent who doesn’t follow the rules but, damn it, gets the job done. He’s joined by Crystal (the always watchable Ali Larter), a fellow agent who has history with Martin and suspects he’s past it. And Nelson Gates (Steve Harris), his boss, who doesn’t trust him either but, damn it, knows he’ll get the job done anyway. Outside of the office, Martin has an ex-wife who grudgingly understands his flaws and a son he ignores in favour of work. Martin is, in short, exactly what you expect from a TV show secret agent, especially one in a series from Homeland and 24 creator Howard Gordon. Except for one crucial difference: he’s played by Sean Bean. In ordinary circumstances, of course, convention dictates that Sean Bean’s character should die on screen, preferably as soon as possible. We first join him in the field infiltrating a gang, where he is swiftly suspected of being a cop. One thing leads to another and a grenade goes off within a couple of metres of him. Incredibly, Sean Bean doesn’t die. That’s the first sign that Legends has potential to be something interesting – if only it didn’t stick so closely to the rules for the rest of the time. Bean is great as Martin, relishing the chance to take the lead in a show for more than a few episodes. His gift – the ability to become a “legend” (a fake identity invented for undercover work) – gives Sean a chance to drift between accents, switching from his gruff English voice and adopting a stammer and an American whine in the blink of a bespectacled eye. It’s a neat enough gimmick for a secret service procedural thriller, directed with verve by Heroes and American Horror Story’s David Semel. That seamless slide between personas inevitably feeds directly into the show’s tension: naive newcomers to the team may be in awe of the infamous Odum, but as Bean keeps things impressively understated as the edgy agent, the question soon changes from whether he can infiltrate a group of bombers to whether he knows the difference between his identities anymore. Is everything he believes to be true actually a lie as well? Which is where our clichéd ultimatum comes in. As the old saying goes, if it isn’t shouted at your hero by a strange man in the street, it’s not a dramatic plot twist. Legends is one of those shows that has no shame in following conventions. But in a golden age of demanding, complex TV programmes, it’s fun to have something silly to follow – and Homeland’s Howard Gordon is king of entertaining silliness. After all, as Legends’ first episode shows, even the most obvious twists can still be dramatic. Photo: © Warner Bros. Entertainment, Inc.